Families that play together stay together! You are here: Home / Board Games / Battle Sheep Review – Wooly Warfare! Battle Sheep Review – Wooly Warfare! Battle Sheep is a cute, fun tactical game. It’s super easy to teach and learn but, don’t be fooled by its simple design! There’s still ample room for strategy and “take that” type gameplay. It’s similar to “Hey That’s my Fish!” but with a lot less setup required. And instead of taking tiles away like in “Hey, That’s my Fish!” you’re trying to spread your sheep over as many tiles as possible in Battle Sheep. The game is rated for ages 7 and up but we think kids as young as 5 could play and have fun. Short and sweet, it takes approximately 15 minutes to complete at most. Game components are simple and durable (great for young kids). The learning curve is easy for both kids and adults (you can learn the game from clear instruction on the back of the box). The setup is minimal. Components include sheep tokens (each player receives 16 in their chosen color), and small pasture pieces (each player get 4 pastures). All of the pasture pieces are identical in size, shape, and color. Once each player has chosen their sheep color and received their pastures they randomly place the pasture pieces together in a board type configuration. Then each player takes their stack of 16 sheep tokens and places it where they want around the edge on one of their own pasture boards. Keep in mind the object of the game is to spread your flock over as many pasture spaces as possible. Players need to avoid being blocked in by other players sheep. When placing your stack the goal is to try not to get trapped! Players then take turns moving one or more tokens from their stack (leaving one or more behind) to place their sheep directionally throughout the pastures. This continues until sheep hit another player’s stack or another edge of the board. You can’t jump on or over any opposing sheep. The game continues until no more sheep tokens can be moved (players are blocked or all of a player’s sheep tokens are individually placed). Then the player’s determine who has the most sheep occupying the most pastures. The person with the most space dominated wins! Simple, high quality (durable) game pieces. Easy to teach and learn. Teaches abstract thinking and strategy. Not a game for serious gamers. Although there is no luck involved in the play there also is not a lot of deep thinking (hence great for kids). 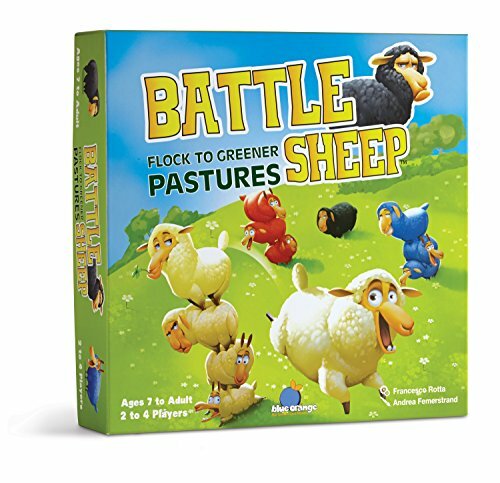 Battle Sheep is a fun game comprised of high-quality game pieces. It’s easy to learn and quick and easy to play. 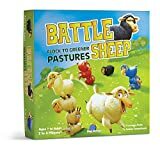 Battle Sheep earns a high replay value because it’s designed for 2, 3, or 4 players and players can build a unique game board with each new game! It’s a great game to teach kids about abstract thinking and strategy. Rory's Story Cubes Review- Let the Good Times Roll with Your Imagination! Best Family Boardgames is a participant in the Amazon Services LLC Associates Program, an affiliate advertising program designed to provide a means for sites to earn advertising fees by advertising and linking to amazon.com.